Enlarge Up to four source devices (e.g. DVD player, Sat receiver etc.) and two receivers (e.g. 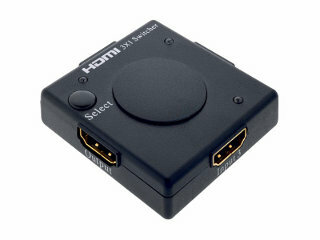 LCD or plasma) can be connected to the Excellence HDMI cross switch 4 x 2 high speed, short HDMI matrix or HDMI cross switch. Independently from one another, the matrix can assign each of the four inputs to each of the two outputs. This means that two different sources can be reproduced at the same time and displayed on one TV. 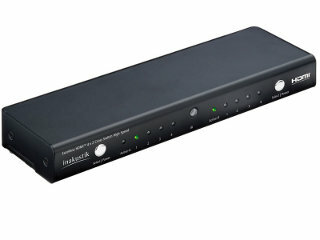 In addition to output A, a digital audio output (SP-Dif) is also available. It can be operated directly on the device or by using the efficient remote control and is supported by the LED display. Enlarge The compact HDMI switch has three inputs and one output. 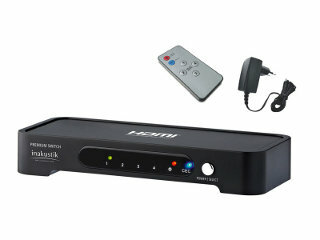 It is compatible with Full HD and does not require a separate power supply. Switching between the sources is done automatically or manually at the touch of a button.